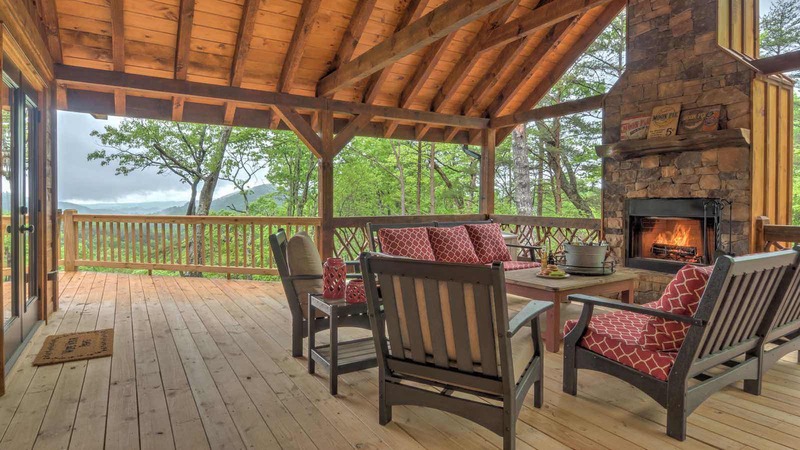 Blue Sky Lodge is a gorgeous, custom built luxury cabin tucked into the mountain side in the Aska Adventure area, yet less than 7 miles from Downtown Blue Ridge! 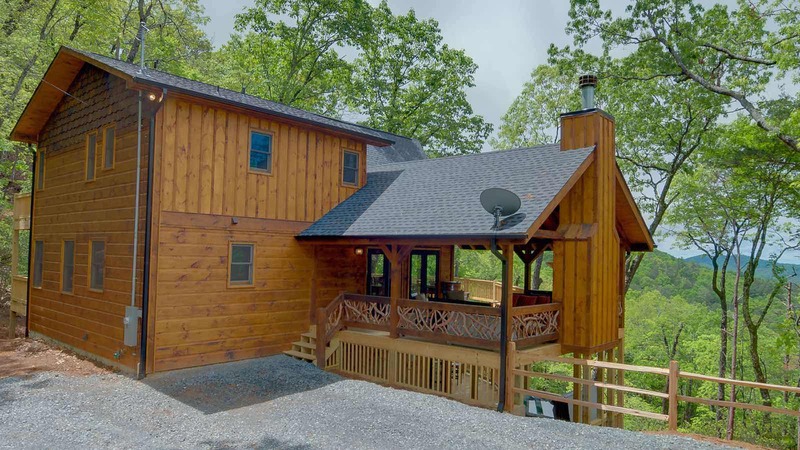 From the parking area, you'll access the cabin via the gorgeous cabin deck. 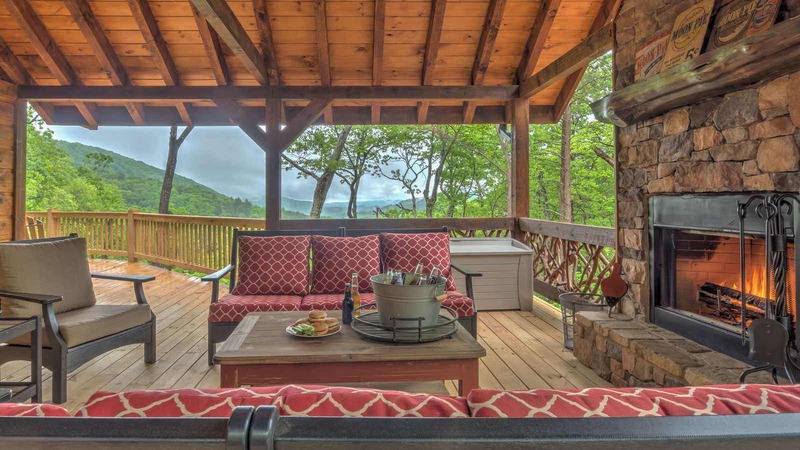 This deck offers a wonderful seating area around the stone wood burning outdoor fireplace with authentic reclaimed Mountain Laurel deck railing. This deck wraps around the main level of the cabin including the ideal prowl front facing the view with seating for sunbathing or enjoying the evening sunsets. Enter the main level to discover the gourment granite counter topped kitchen and great room. The kitchen has stainless steel appliances as well as stacked stone bar with seating for three guests. The greatroom has soaring ceilings, lots of large glass windows for viewing the mountains, a stone gas log fireplaces, cozy sofa seatings, and a dining table for 6 guests. Just off the kitchen is a powder room and the main level bedroom. This bedroom has a Queen sized bed and its own bathroom with a double vanity granite counter top and tile shower. Up the Mountain Laurel staircase is the master bedroom! The master bedroom offers a King size bed, a luxurious master bath that boasts a granite counter top double vanity, large tile shower, and a garden tub. The master bedroom also has a private balcony, ideal for drinks for two while relaxing in the mountain air! Down the stairs to the 3rd level is the gameroom level and 3rd bedroom. The gameroom has a stone gas log fireplace, pub/card table, wet bar with granite counter top, and the 3rd bedroom and bathroom. This bathroom has a single granite counter top and a tub shower combo. The bedroom adjacent to it has a Queen size bed. Just outside the gameroom level is the lower level deck with has the hot tub, patio seating, and access to the awesome outdoor firepit. 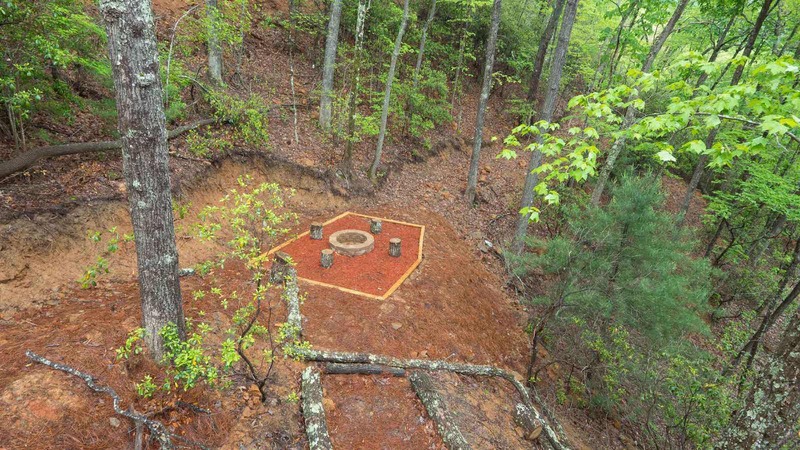 Enjoy making fireside memories or roasting marshmellows over the open firepit. The hot tub on the deck is perfect for soaking cares away and enjoying an evening glass of wine with some friends. Blue Sky Lodge is ideal for couples or individuals looking to escape to the mountains in luxury!